In my last blog, I’ve covered the issue of building great relationships in Agilcon and how this reflects employee’s engagement at work. Today, we are going to take a closer look at the employee’s engagement through the lens of opportunities. Let’s put it into numbers this time. According to Gallup, every company (and country) can calculate the expense of disengaged employees. Let’s take, for example, an imaginary IT ABC company in Slovenia with 100 employees (SKD activity – J62.0 Information technology service activities). So, without any further doubts, the numbers speak for themselves. 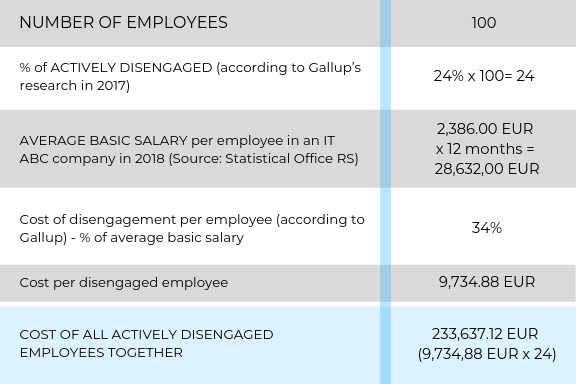 The cost of having disengaged employees in so high, that it is worthwhile to invest time and money in making the company they work in a world of opportunities. Career planning is more flexible and open. It includes the use of different tools in order to really understand employee’s skills, interests, competencies, etc. Therefore, we plan our onboarding program for beginners very carefully, making sure they have a buddy and a mentor. The focus of the performance management process is not only in defining his or her level of required competence and actions to be taken, but also in communicating what an employee really wants, what his or her vision is, and how Agilcon can help him/her. The team leads and managers act as mentors and support employees in their engagement to be a better engineer, consultant or project manager. Career path includes different aspects of horizontal and vertical promotion. SEE happier and productive employees. In Agilcon, we dare to Dream Big. Therefore, we make sure our goals are not only SMART but SMARTER, meaning they are Specific, Motivational, Attainable in the mind’s eye, Relevant, Trackable, Enjoyable, and Rewarding. Yes, this is a process and it takes time and some bumps along the way, but what’s the meaning of having goals if you cannot find them enjoyable and motivational. Of course, numbers matter, but we believe in having goals that an employee can identify with and truly find satisfying and the numbers will follow. In this spirit, we also have our Big Hairy Audacious Goal and the next step is to encourage employees to set their own personal BHAG whether it is connected to Agilcon or their personal development. As I’ve already mentioned, mentoring is a part of Agilcon’s culture. We understand that by creating a place of creativity, developing new skills, and sharing knowledge and passion employees can and will perform better. Coaching is, therefore, an important part of the employee’s development. Our team leads and managers are getting better and better in this part of their role as a leader because they themselves went through the same process. Being allowed to make and learn from their own mistakes gave them a priceless lesson in how to communicate, give feedback, and be a positive role model for their employees. A number of different training, trailheads, webinars, and excursions are available in Agilcon. Because we know that only by hearing, trying out, and using knowledge in practice repeatedly you can upgrade your competence. As individuals, we learn and grow. And what is a great opportunity if not a place where it is OK to make mistakes and where it is normal to learn from others in order to be more satisfied with yourself? A good friend of mine once said opportunities lie everywhere around if only you are willing to take them. As in the case of Agilcon, a person must be blind not to see what this firm has to offer.